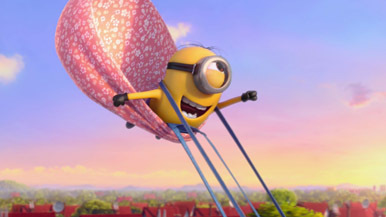 After Despicable Me (2010) grossed over $500 million worldwide, a sequel was inevitable. And because three years have passed since the original (a long time by Hollywood standards), I figured and hoped the filmmakers would have conjured up a relevant and clever story for Despicable Me 2. Unfortunately, that’s not the case. Despite the amount of time between the two, DM2 comes off as rushed and undercooked. Don’t get me wrong. I like Gru, the ex-super-villain who, by the end of the first movie, had changed his ways and turned over a new leaf to become a loving father to three sweet girls, but the plot of DM2 proved too mundane and inconsequential for me. Even though it’s meant to be light, silly and kid-centric, I still wanted it to push the story and characters forward in creative and interesting ways. After all, isn’t that the point of a sequel? Technically speaking, I suppose the movie does progress the adventures of Gru (voice of Steve Carell) and his three adopted daughters, Margo (Miranda Cosgrove), Agnes (Elsie Kate Fisher) and Edith (Dana Gaier), albeit in a predictable way. Because Gru is a single father, and the girls are without a mother, it stands to reason the filmmakers would forge a story that completes their family puzzle by providing Gru a love interest. This is a sweet enough angle, but we’ve seen it before, and it’s surrounded by a rather lame-brained subplot that’s not as engaging as we otherwise hoped given the freshness of the original. When the movie opens, a research lab in the Arctic Circle is yanked from the earth by a giant magnet. Silas Ramsbottom (Steve Coogan), head of the Anti-Villain League (AVL), is concerned because the crew was working on a serum that transforms its victims into purple, ravenous beasts with insatiable appetites. The AVL doesn’t want this falling into the wrong hands, so they send one of their new agents, Lucy Wilde (Kristen Wiig), out into the field to recruit Gru. They need his expertise as a former megalomaniac (remember, this was the guy who stole the moon) to help track down and thwart the latest criminal mastermind before he (or she) takes over the world.